Sewing Pieces: Patterns and Fabrics on Sale! Patterns and Fabrics on Sale! Temptation, temptation...Stop! I kept telling myself but I can’t help it. I am just human. My favorite store started their Columbus Day sale today. As usual, I bought plenty patterns again for my FUTURE sewing projects. So much for challenging myself! I subscribed to their email campaign so every now and then I know what’s on sale. Patterns are sale for $1 each so for me it is rather urgent more than anything else. Regular Price for patterns range from $2 to $19 and I only buy when it’s on sale but I always get carried away. Have you heard the saying - “only fools pay full price”? When I’m in the store, I go straight to the pattern area and had been my routine. 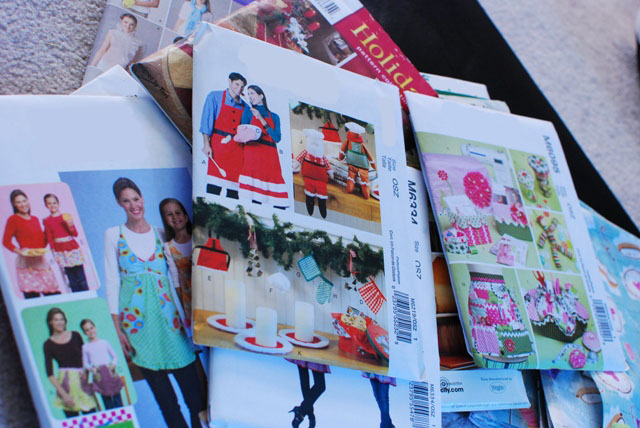 I don’t stick around browsing the catalogues because the longer I stay - chances are the more stuff I buy. Here’s my strategy, I usually browse the manufacturers websites to look for the patterns I want then I buy it in store. That way I’m out of the store in 15 minutes or so. I also bought a black vinyl to cover my piano’s chair and a fabric for my apron project. Hi, Jane!..haha..now you got plenty of beautiful patterns to look at... perhaps time to start sewing ;P .. Thanks for visiting Ritz. It will surely keep me busier. I am currently sewing my son’s Halloween costume and hopefully I can post it soon. Usually, I have the hardest time figuring out how to start properly again because I last used my sewing machine 2 years ago. Halloween 2011. Calling all sickies!